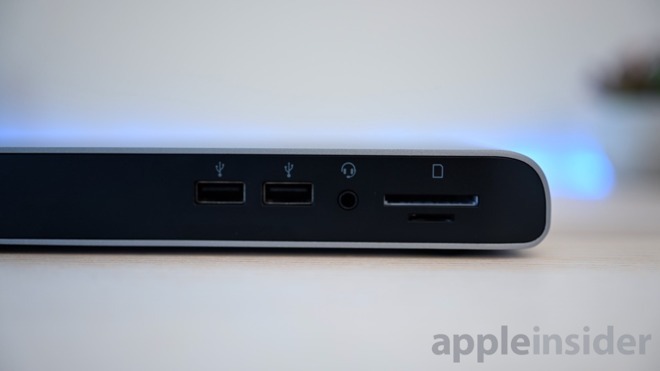 Elgato — which is now part of Corsair — debuted the Thunderbolt 3 Pro Dock during CES. 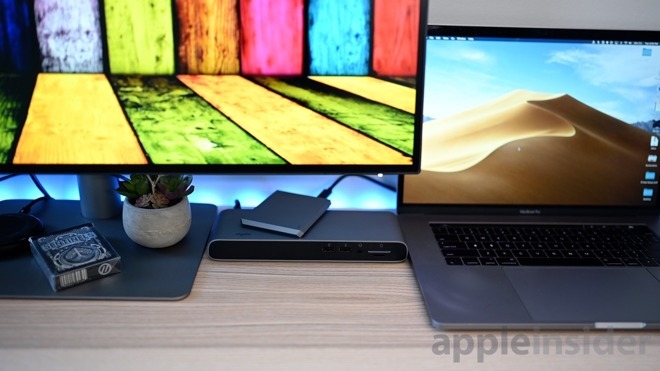 At that time, we were most excited to see it as the first Thunderbolt 3 dock to incorporate not just the USB-C Thunderbolt 3 downstream port, but two more USB type-C ports. After reveal at the 2019 Consumer Electronics Show, we've been able to get our hands on one and have been using it to simplify our workflow ever since. 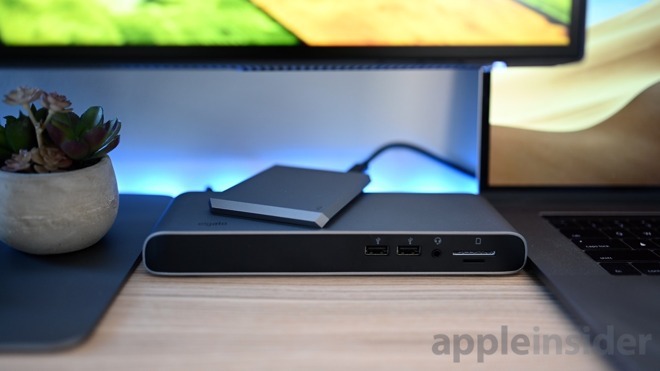 Elgato's quality has always been fantastic, and that applies to the Thunderbolt 3 Pro Dock too. 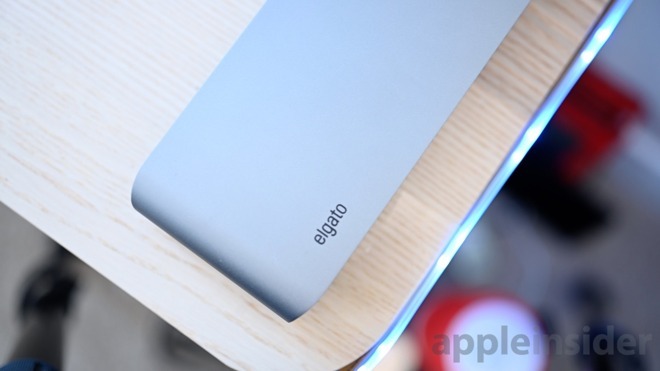 The outside is a premium aluminum finish with feet that are ever so reminiscent of the legacy Mac Pro. If you've seen a Thunderbolt 3 dock before, you know what to expect for size of the unit itself. As with the rest, a large external power brick makes for some added bulk under the desk. Luckily, it passes the full 87W of power to a 15-inch MacBook Pro, so that is one less thing that needs its own outlet. Those ports that Elgato believes you will use with some frequency are located on the front of the dock. That includes the two card readers, the audio jack, and the two USB-A ports. We don't love the layout of the SD card readers, though, as the larger SD card is positioned directly above the microSD card reader. If you have both cards in, it can be difficult to see/access the microSD below. Had they been swapped, you could more easily see microSD card without it being obfuscated by the larger SD card. Since we have two Thunderbolt 3 ports, this makes it easy to daisy chain additional Thunderbolt devices. 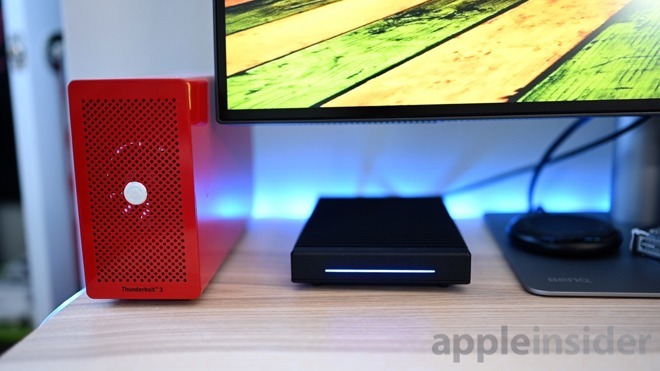 For example, you can connect your Mac to the Elgato Pro Dock, which can then connect to an ultra-fast solid state drive, which can connect to an eGPU, which can then connect to your display. 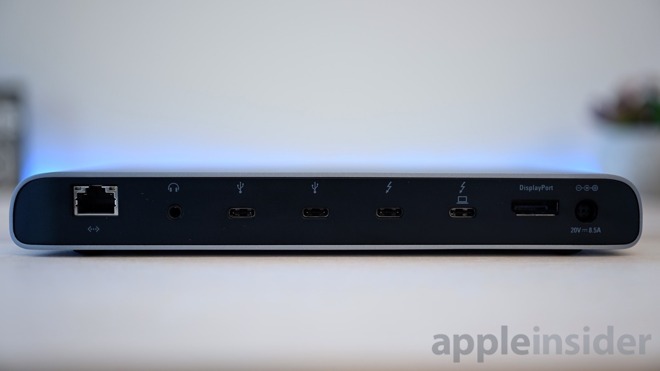 All of which will only utilize a single port on the back of your dock and Mac. Video output here is on par with many other Thunderbolt 3 docks. Two 4K displays can be driven simultaneously at 60Hz through the Thunderbolt 3 and DisplayPort ports, or a single 5K display can be connected over Thunderbolt. From our MacBook Pro, we saw no issues with these displays though less powerful machines may struggle with the top outputs. To eject everything at once, Elgato has a Mac utility to eject the dock and all connected drives simultaneously. The current work culture has been shifting away from workstations with a dedicated desktop, to a portable machine with a desktop monitor. That's how we tend to work here at AppleInsider. Multiple staffers use a MacBook Pro around the home and office. When I need to sit down to edit, I sidle up at my desk with all my peripherals located desk-side. As a video producer, I've got countless accessories hanging around my desk, but most prominently is my LaCie 2Big 20TB Thunderbolt 3 storage bay, my BenQ Thunderbolt 3 display, and my Akitio Node Lite Thunderbolt 3 enclosure with a 1TB Intel Optane SSD. On top of this, tack on a plethora of SD and microSD cards, more portable hard drives, my wired MW50+ headphones, my Blue microphone for podcasting and voiceovers, and a hardwired gigabit Ethernet connection for fast video uploading, I've got a lot to wire up. Without a dock, I'd have an insane number of adapters and far to few ports to handle it all. Using the Elgato Thunderbolt 3 Pro Dock, I simply set my machine down, connect a solo TB3 cable, and I'm ready to go. When I need to head out for a shoot, I just use the Elgato utility to eject all my peripherals and head on my way. It doesn't get easier than that. The Thunderbolt 3 Pro Dock can be ordered from Corsair or Amazon for just under $350.